Modded Glowing Version of Thor’s Hammer « Adafruit Industries – Makers, hackers, artists, designers and engineers! Do you have the power to wield Mjolnir? I think the woman who made this light-up version of Thor’s Hammer does. 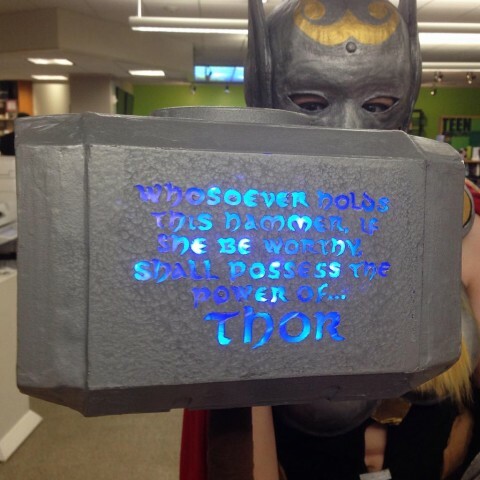 This cosplayer attended Atomic Comicon at the Tacoma Public Library and crafted Mjolnir so that the all-important inscription glows. It looks like she used blue LEDs to add the effect. Hey that’s me! I did indeed use blue LEDs for the effect, I had cut out a piece of plastic from a clipboard, cut out masking tape letters and stuck them on before spray painting over it. Peeled the tape lettering off when the paint was still wet, and voila, clear letters for light to shine through! I know that woman! I think she just used a regular strand of LEDs, and a blue filter. She DID make Mjolnir hollow so that she could keep her stuff in it. So, practical as well as light-up.